Did you know that a windmill used to be the main landmark in Lawrence? The “Old Dutch Windmill,” as many called it, was located near the corner of what is now 9th Street and Emery Road. It was the first wind-driven mill in Kansas, and Lawrence was chosen as the location for the mill because there was a lot of grain farming in the area and the town was rapidly growing. The idea to erect the mill came from business partners John Wilder and Andrew Palmquist (whose name was later changed to Palm when he became a naturalized U.S. citizen). Palm returned to his native Sweden for several months to get help with the mill’s design. He brought back machinery as well as several millwrights—craftsmen who specialized in building windmills. Construction on the mill began in July of 1863. The mill sustained some minor damage during William Quantrill’s raid on Lawrence on August 21st of that same year. However, the damage was quickly repaired and the mill was completed in June of 1864. 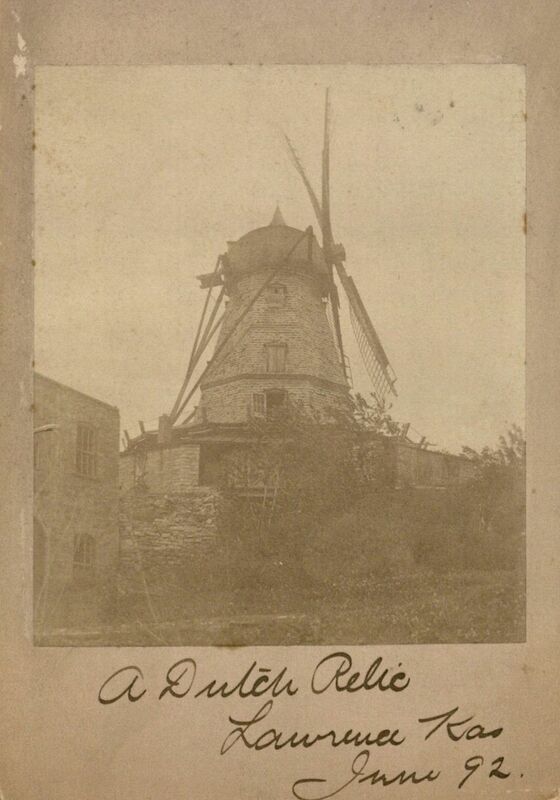 Left: “A Dutch Relic”: Lawrence Windmill, June 1892. Lawrence Photo Collection. Call Number: RH PH 18 E:5. 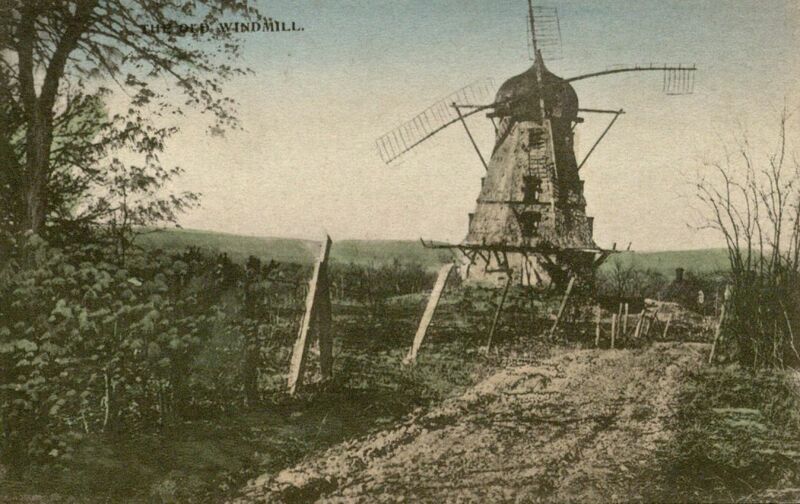 Right: Lawrence Windmill with man sitting where the windmill’s arms intersect, undated. Lawrence Photo Collection. Call number RH PH 18 E:16(f). Click images to enlarge. 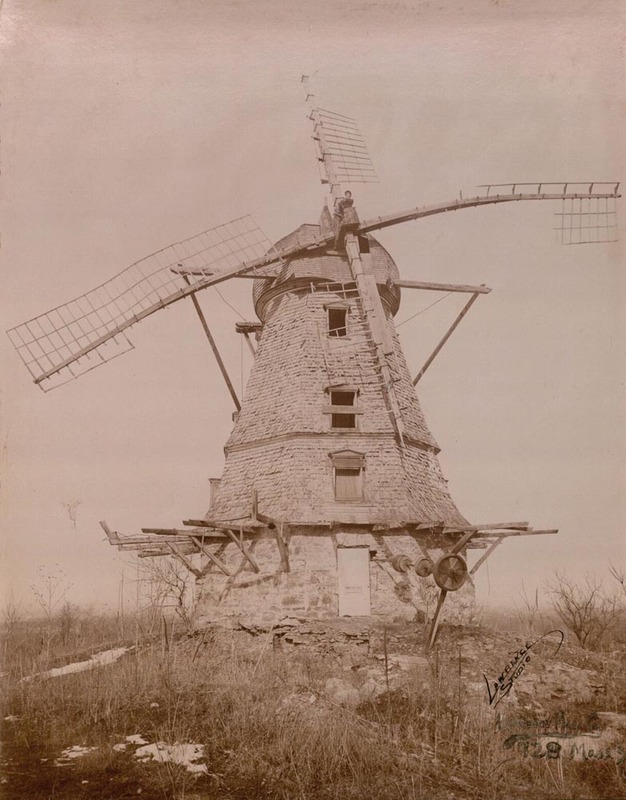 The Lawrence windmill had two sets of millstones—one to grind corn and the other to grind wheat—which were imported from France due to their high quality. The windmill measured 64 feet above ground level and each of the arms was 34 feet long. It had an octagonal shape, with shingles on the upper part of the windmill and a base made of stone. These features are considered typical of Dutch windmills. However, the Lawrence windmill had a unique feature with its onion-shaped dome, which can be seen on some Swedish churches. Color postcard of the Lawrence Windmill, undated. Lawrence Photo Collection. Call Number: RH PH 18 E:20.1. Wilder and Palm used the windmill not only for grinding wheat and corn, but also to power their manufacturing business where they made carriages and plows. The business partners even produced their own brand of flour and were quite successful with their enterprises for several years. But by the 1880s there were larger mills in Douglas County that could grind more bushels of grain per day than the Lawrence windmill. Wilder and Palm had also acquired quite a bit of debt. In July of 1885, the company went into receivership—a type of corporate bankruptcy. Assets were liquidated over the next two years and the windmill stood unused until April 30, 1905 when it was destroyed by fire. 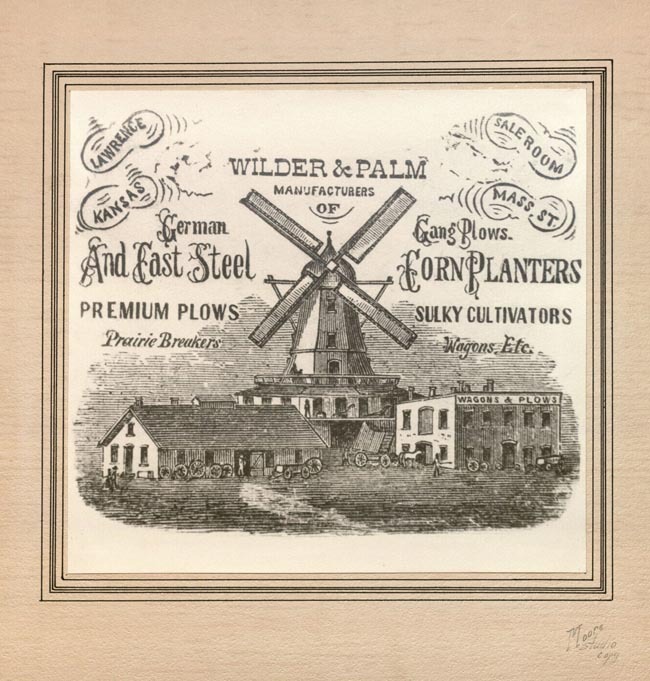 Advertisement for Wilder and Palm featuring the Lawrence Windmill, undated. Lawrence Photo Collection. Call Number: RH PH 18 E:49(f). Click image to enlarge. It was only after the mill stopped working that it became a symbol of the community. It was a popular picnic spot for KU students and was the subject of paintings, drawings, and photographs. More information about the “Old Dutch Windmill” can be found in John M. Peterson’s article “The Lawrence Windmill” in Kansas History: A Journal of the Central Plains, volume 3, issue 3, Autumn 1980, which is available in the Reading Room of the Kenneth Spencer Research Library (Call number F 681 .K177 v.3:3). Additionally, in Spencer Library’s Kansas Collection, there is a paper entitled “Once Upon a Time: A Windmill in Lawrence” written by Jean Paul Pentecouteau in 1987 (Call number RH D6161). Pentecouteau was a student in KU’s School of Architecture and Urban Design. This entry was posted on Thursday, August 15th, 2013 at 4:50 pm and is filed under Kansas Collection. You can skip to the end and leave a response. Pinging is currently not allowed.